Search for the best flight prices from Manchester to Cayo Coco. Compare prices, book today and save money with Manchester Airport. Cayo Coco (or Coco Key in English) is home to a whole set of rather exclusive all-inclusive resorts and mile upon mile of undisturbed white powdered sand beaches. 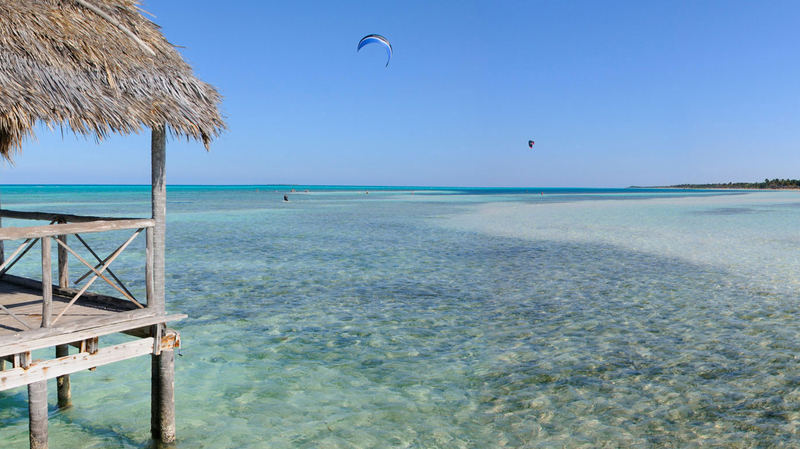 The island itself is part of a chain known as the Jardines Del Rey (King’s Gardens), which extends across 120 miles of pristine coral reef along Cuba’s northern shore. This idyllic sandy island in central Cuba is renowned for its shiny, all-inclusive beachside resorts. Think pools fringed with sunloungers and sun-baked views of sugar-white stretches – Cayo Coco is a place of minimum effort and maximum chill out. Meliá Cayo Coco (Jardines del Rey) is one of the most popular resorts that’s oozing romantic vistas and luxurious touches – for the ultimate luxury, nab one of the suites built on stilts over the water. Its adults-only policy also adds to the exclusive feel. Tryp Cayo Coco (Jardines del Rey) is a lovely family option, with a huge pool and lots of on-site entertainment. For a laid-back, smaller-scale hotel, try Hotel Playa Coco (Carretera Cayo Guillermo). It is wise to bring essentials such as toiletries with you to Cayo Coco, as shopping is pretty limited – the island is primarily made up of holiday resorts. However, resorts do tend to have on-site shops, largely selling useful beach accessories such as towels, sun hats and colourful T-shirts. Being Cuba, bottles of rum and fat cigars are also popular souvenirs. These can be picked up at the airport on the way out for convenience – often for the cheapest price as well. Local artisans, who regularly frequent resorts and beaches, sell an assortment of trinkets of varying quality. Luxurious, all-inclusive resorts are the name of the game here, so holidaymakers tend to dine in whichever resort they are housed. Food is generally fresh and varied, with a mix of Cuban dishes and international fare. Resorts with good restaurants include Meliá Cayo Coco (Jardines del Rey), which has a selection of eateries, including an à la carte gourmet restaurant, a Spanish tapas bar and a poolside snack bar. Hotel Colonial (Jardines del Rey) serves a good buffet-style breakfast, lunch and dinner; while the Cuban fare at Sitio la Güira (in the community of the same name) goes down well with its guests. Founded by renowned Cuban novelist Alejo Carpentier, this national book fair has become Cuba’s most publicised and biggest literary event. Thousands of bookworms flock to Havana’s San Carlos de la Cabaña Fortress every February, while events in other towns and cities throughout the country take place in the subsequent weeks. Cuba’s young rock and metal bands and aspiring musicians are encouraged to strut their stuff at this feisty event in Pinar del Río in western Cuba. The festival provides an ear-bashing alternative to the summery Afro-Latino vibes of Cuba’s more traditional music. This lively celebration is one of Cuba’s most exuberant, and a wonderful spectacle for those visiting the area. Santiago Carnival takes place every year for a week in late July. Hotels in Santiago get quickly booked up during carnival time, so it’s wise to secure a room well in advance. This biennial festival of Cuban music in Cienfuegos shows off a fine selection of Cuba’s singers and musicians while paying homage to the popular Cuban singer Benny Moré. As well as plenty of musical offerings, the festival also includes exhibitions and talks, and tours of the singer’s hometown Santa Isabel de las Lajas. The modest and laid-back town of Remedios becomes the setting for one of the country’s most popular outdoor celebrations in late December when Las Parrandas comes to town. This feisty festival is an intense experience that's not for the fainthearted, with explosive fireworks and large, passionate crowds.